HSC70 (also known as HSC71, HSC73, HSP73, p72, prp73) is expressed constitutively and is slightly heat-inducible. HSC70 binds to the exposed loop of clathrin light chains to promote uncoating and can also bind the cytoskeleton which may facilitate cytoskeletal rearrangements. HSC70 has been shown to stimulate lysosomal degradation of intracellular proteins and to retard both aggregation and folding of mitochondrial precursor proteins in vitro. The HSP 70 family is a set of highly conserved proteins that are induced by a variety of biological stresses, including heat stress, in every organism in which the proteins have been examined. The human HSP 70 family members include: HSP 70, a protein which is strongly inducible in all organisms but which is also constitutively expressed in primate cells; HSP 72, a 72 kDa protein that is induced exclusively under stress conditions; Hsc 70, or cognate protein, is a 72 kDa, constitutively expressed, protein which is involved in the uncoating of clathrin coated vesicles; GRP 78, or BiP, is a glucose regulated 78 kDa protein localized in the endoplasmic reticulum; and p75, or Hsc 75, a 75 kDa protein that is found within the mitochondria. Hsc 70 (also known as Hsc 71, Hsc 73, Hsc 73, p72, prp 73) is expressed constitutively and is slightly heat-inducible. Hsc 70 binds to the exposed loop of clathrin light chains to promote uncoating and can also bind the cytoskeleton which may facilitate cytoskeletal rearrangements. Hsc 70 has been shown to stimulate lysosomal degradation of intracellular proteins and to retard both aggregation and folding of mitochondrial precursor proteins in vitro. Our Abpromise guarantee covers the use of ab2788 in the following tested applications. IHC-P 1/20 - 1/200. Perform heat mediated antigen retrieval via the microwave method before commencing with IHC staining protocol. WB 1/1000 - 1/5000. Detects a band of approximately 70 kDa. Acts as a repressor of transcriptional activation. Inhibits the transcriptional coactivator activity of CITED1 on Smad-mediated transcription. Chaperone. Isoform 2 may function as an endogenous inhibitory regulator of HSC70 by competing the co-chaperones. The N-terminal 1-386 residues constitute the ATPase domain, while residues 387-646 form the peptide-binding domain. Cytoplasm. Melanosome. Localized in cytoplasmic mRNP granules containing untranslated mRNAs. Translocates rapidly from the cytoplasm to the nuclei, and especially to the nucleoli, upon heat shock. Identified by mass spectrometry in melanosome fractions from stage I to stage IV. 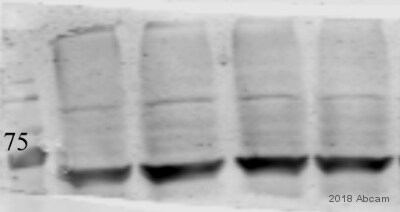 Western blot analysis of Hsc70 was performed by loading 50µg of the indicated whole cell lysates and 15µl of prestained protein ladder onto a 4-20% Tris-HCl polyacrylamide gel. Proteins were transferred to a PVDF membrane and blocked with 5% BSA/TBST for at least 1 hour. The membrane was incubated with ab2788 (1:1000) overnight at 4°C on a rocking platform, washed in TBS-0.1%Tween 20, and incubated with a goat anti-mouse IgM-HRP secondary antibody (1:20,000) for at least 1 hour. Chemiluminescent detection was performed. Immunohistochemistry was performed on both normal and cancer biopsies of deparaffinized human Prostate carcinoma tissue. To expose target proteins, heat induced antigen retrieval was performed using 10mM sodium citrate (pH6.0) buffer, microwaved for 8-15 minutes. Following antigen retrieval tissues were blocked in 3% BSA-PBS for 30 minutes at room temperature. Tissues were then probed at a dilution of 1:200 with a mouse monoclonal antibody recognizing Heat Shock Cognate Protein 70 (ab2788) or without primary antibody (negative control) overnight at 4°C in a humidified chamber. Tissues were washed with PBST and endogenous peroxidase activity was quenched with a peroxidase suppressor. Detection was performed using a biotin-conjugated secondary antibody and SA-HRP, followed by colorimetric detection using DAB. Tissues were counterstained with hematoxylin. Immunohistochemistry was performed on both normal and cancer biopsies of deparaffinized human Tonsil tissue. To expose target proteins, heat induced antigen retrieval was performed using 10mM sodium citrate (pH6.0) buffer, microwaved for 8-15 minutes. Following antigen retrieval tissues were blocked in 3% BSA-PBS for 30 minutes at room temperature. Tissues were then probed at a dilution of 1:20 with a mouse monoclonal antibody recognizing Heat Shock Cognate Protein 70 (ab2788) or without primary antibody (negative control) overnight at 4°C in a humidified chamber. Tissues were washed with PBST and endogenous peroxidase activity was quenched with a peroxidase suppressor. Detection was performed using a biotin-conjugated secondary antibody and SA-HRP, followed by colorimetric detection using DAB. Tissues were counterstained with hematoxylin. Immunohistochemistry was performed on both normal and cancer biopsies of deparaffinized human Testis tissue. To expose target proteins, heat induced antigen retrieval was performed using 10mM sodium citrate (pH6.0) buffer, microwaved for 8-15 minutes. Following antigen retrieval tissues were blocked in 3% BSA-PBS for 30 minutes at room temperature. Tissues were then probed at a dilution of 1:20 with a mouse monoclonal antibody recognizing Heat Shock Cognate Protein 70 (ab2788) or without primary antibody (negative control) overnight at 4°C in a humidified chamber. Tissues were washed extensively with PBST and endogenous peroxidase activity was quenched with a peroxidase suppressor. Detection was performed using a biotin-conjugated secondary antibody and SA-HRP, followed by colorimetric detection using DAB. Tissues were counterstained with hematoxylin. Immunofluorescent analysis of Heat Shock Protein 70 using Heat Shock Protein 70 Monoclonal antibody (13D3) ab2788 shows staining in HeLa cells. Heat Shock Protein 70 staining (green) F-Actin staining with Phalloidin (red) and nuclei with DAPI (blue) is shown. Cells were grown on chamber slides and fixed with formaldehyde prior to staining. Cells were probed without (control) or with or an antibody recognizing Heat Shock Protein 70 ab2788 at a dilution of 1:20-1:200 over night at 4 ?C washed with PBS and incubated with a DyLight-488 conjugated secondary antibody. Images were taken at 60X magnification. Immunofluorescent analysis of Heat Shock Protein 70 using Heat Shock Protein 70 Monoclonal antibody (13D3) ab2788 shows staining in MCF-7 cells. Heat Shock Protein 70 staining (green) F-Actin staining with Phalloidin (red) and nuclei with DAPI (blue) is shown. Cells were grown on chamber slides and fixed with formaldehyde prior to staining. Cells were probed without (control) or with or an antibody recognizing Heat Shock Protein 70 ab2788 at a dilution of 1:20-1:200 over night at 4 ?C washed with PBS and incubated with a DyLight-488 conjugated secondary antibody. Images were taken at 60X magnification. Immunofluorescent analysis of Heat Shock Protein 70 using Heat Shock Protein 70 Monoclonal antibody (13D3) ab2788 shows staining in NIH-3T3 cells. Heat Shock Protein 70 staining (green) F-Actin staining with Phalloidin (red) and nuclei with DAPI (blue) is shown. Cells were grown on chamber slides and fixed with formaldehyde prior to staining. Cells were probed without (control) or with or an antibody recognizing Heat Shock Protein 70 ab2788 at a dilution of 1:20-1:200 over night at 4 ?C washed with PBS and incubated with a DyLight-488 conjugated secondary antibody. Images were taken at 60X magnification. Overlay histogram showing HeLa cells stained with ab2788 (red line). The cells were fixed with 80% methanol (5 min) and then permeabilized with 0.1% PBS-Tween for 20 min. The cells were then incubated in 1x PBS / 10% normal goat serum / 0.3M glycine to block non-specific protein-protein interactions followed by the antibody (ab2788, 1/200 dilution) for 30 min at 22ºC. The secondary antibody used was DyLight® 488 goat anti-mouse IgG (H+L) (ab96879) at 1/500 dilution for 30 min at 22ºC. Isotype control antibody (black line) was mouse IgM [ICIGM] (ab91545, 2µg/1x106 cells) used under the same conditions. Acquisition of >5,000 events was performed. This antibody gave a positive signal in HeLa cells fixed with 4% paraformaldehyde (10 min)/permeabilized with 0.1% PBS-Tween for 20 min used under the same conditions. Publishing research using ab2788? Please let us know so that we can cite the reference in this datasheet. Thank you for your enquiry. 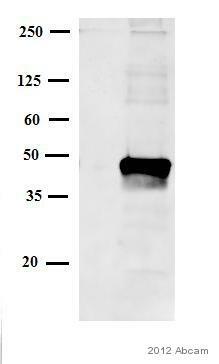 I am sorry to hear that your customer has been having difficulties with this antibody by immunocytochemistry. From a literature search I have determined that this heat shock protein is largely cytoplasmic. For example in the following publication they state that.. "Similar to Hsc90, Hsc70 also has a predominant cytoplasmic localization.....". Furthermore they demonstrate cytoplasmic staining in HeLa cells using GFP-Hsc70 fusion constructs. Ogawa S, Oishi H, Mezaki Y, Kouzu-Fujita M, Matsuyama R, Nakagomi M, Mori E, Murayama E, Nagasawa H, Kitagawa H, Yanagisawa J, Yano T, Kato S. Repressive domain of unliganded human estrogen receptor alpha associates with Hsc70. Genes Cells. 2005 Dec;10(12):1095-102. PMID: 16324147. Furthermore according to the Swiss-Prot database it details that Hsc70 "translocates rapidly from the cytoplasm to the nuclei, and especially to the nucleoli, upon heat shock". I would suggest that your customer performs heat shock on their cells to determine whether there is indeed a translocation of the cellular localisation by Hsc70 following heat shock. I hope this information helps, please do not hesitate to contact us if you need any more advice or information. Thank you for your enquiry. All the information we have on species cross reactivity is specified on the datasheet, these are updated as soona s any new information is brought to our attention. As far as we are aware, cross reactivity with Drosophila has not yet been tested for use with ab2788. Should you decide to go ahead and purchase this product, please let us know how you get on and in return we will forward a reward of your choice, typically an Amazon gift voucher. Please let me know if you require any further assistance.